Kill That Feedback – Play UBass! Great option if you experience feedback while playing your Ubass in a ”noisy/loud” environment! Big thanks to Mike Upton for the demo and Dean Tomasula for the blog post! 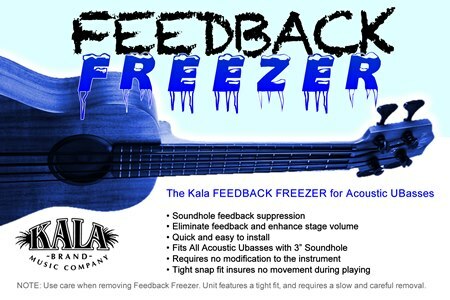 Kala’s Feedback Freezer can eliminate much of the feedback from your A/E uBass in a band situation. Unless you’re in a Jimi Hendrix tribute band, you probably do not welcome feedback while you are playing. But if you are plagued by feedback while jamming out on your uBass, Kala has got you covered. Or, more precisely, your uBass’s soundhole covered. Enter the Kala Feedback Freezer. What’s a Feedback Freezer, you ask? Basically it’s a plastic cap you snap into the soundhole of your acoustic/electric uBass that dramatically reduces the instruments ability to feed back. Just snap the Feedback Freezer into any uBass with a 3″ soundhole, and off you go. It does not require any modifications to your uBass. The Feedback Freezer won’t totally eliminate feedback, but it will dramatically reduce it, as noted in THIS VIDEO by Mike Upton of Kala. < Quick link to YouTube videos! Thanks for the re-blog Magnus.